After decades of anticipation, Alfred is proud to release the officially licensed, collectible sheet music companion folios to The Legend of Zelda video game series. 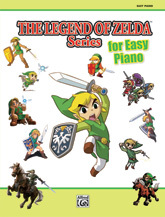 The 33 arrangements in this Easy Piano edition contain the instantly recognizable melodies beloved by generations of gamers around the globe. From Koji Kondo's iconic "The Legend of Zelda Main Theme" to The Legend of Zelda : Spirit Tracks themes, the dozens of pieces in this book represent two and a half decades of Nintendo® video game favorites. Adding to the fun, graphics from the corresponding games grace each page of the sheet music. Impress friends, family, and audiences of all ages by playing from this magnificent collection, which makes a great gift for every pianist. Titles: * The Legend of Zelda Title Theme * The Legend of Zelda Main Theme * Zelda II - The Adventure of Link Title Theme * Zelda II - The Adventure of Link Palace Music * The Legend of Zelda : A Link to the Past Title Screen * The Legend of Zelda : A Link to the Past Hyrule Castle Music * The Legend of Zelda : A Link to the Past Main Theme * The Legend of Zelda : A Link to the Past The Dark World * The Legend of Zelda : Link's Awakening Main Theme * The Legend of Zelda : Ocarina of Time Title Theme * The Legend of Zelda : Ocarina of Time Princess Zelda's Theme * The Legend of Zelda : Ocarina of Time Hyrule Field * The Legend of Zelda : Ocarina of Time Lost Woods (Saria's Song) * The Legend of Zelda : Ocarina of Time Gerudo Valley * The Legend of Zelda : Ocarina of Time Song of Storms * The Legend of Zelda : Majora's Mask Prelude of Majora's Mask * The Legend of Zelda : Majora's Mask Termina Field * The Legend of Zelda : The Wind Waker Main Theme * The Legend of Zelda : The Wind Waker Dragon Roost Island * The Legend of Zelda : The Wind Waker Ocean Theme * The Legend of Zelda : The Wind Waker Molgera * The Legend of Zelda : Four Swords Adventures Village of the Blue Maiden Restored * The Legend of Zelda : Four Swords Adventures Field Theme * The Legend of Zelda : Twilight Princess Hyrule Field Main Theme * The Legend of Zelda : Twilight Princess Hidden Village * The Legend of Zelda : Twilight Princess Midna's Lament * The Legend of Zelda : Phantom Hourglass Ciela's Parting Words * The Legend of Zelda : Spirit Tracks Title Theme * The Legend of Zelda : Spirit Tracks Field Theme * The Legend of Zelda : Spirit Tracks Train Travel (Main Theme) * The Legend of Zelda Triforce Fanfare * The Legend of Zelda Correct Solution * The Legend of Zelda Whistle of Warp. "Best in Show" Award at Winter NAMM 2012 presented by Music Inc. magazine.